Arrive at The Balmoral Hotel on any given day, and the first thing you’ll notice is its glorious clock tower that’s never on time. 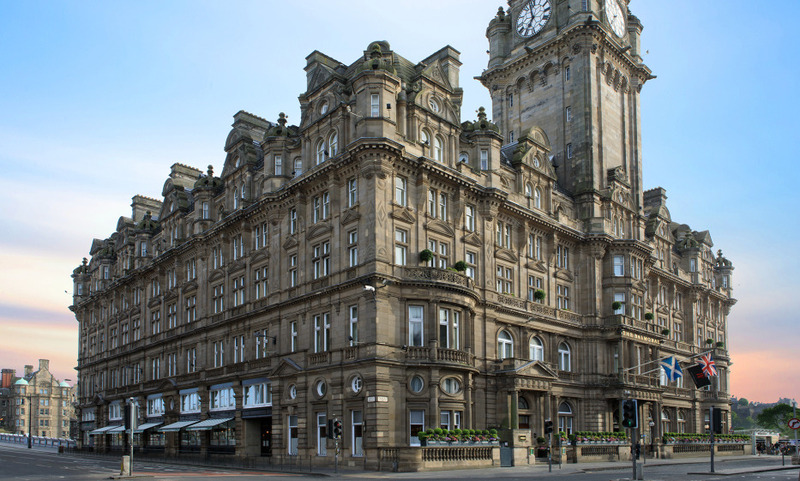 This irregularity (or calculated miscalculation as the locals call it) is a historical quirk as legendary as the hotel itself and dates back to 1902 when The Balmoral was built as a grand railway hotel, and its turret clock was set three minutes fast to make sure passengers never miss their trains. To this day, the hotel’s clock is dependably inaccurate, but everything else about The Balmoral is on point, from its excellent location at the prestigious No. 1 Princes Street address to its world-class facilities, including Brasserie Prince by Alain Roux and Michelin-starred Number One. But the real highlight of the hotel is what designer Olga Polizzi did with its decor. Everywhere you look, the Scottish heritage of the hotel shines through, beautifully infused with 21st-century sophistication (think sweeping staircases, Corinthian columns and gorgeous murals complimented by calmly contemporary furnishings). With so much history and grandeur lying in wait, the Balmoral is right on the money in its claim to be an Edinburgh landmark. It was the best stay I ever had in a hotel. Me and my partner felt welcome from the moment we stepped through the door and the staff were fantastic from start to finish. Me and my partner cannot wait to stay here again. Absolutely wonderful experience, didn't want to leave as the room was so comfortable and the staff so friendly it felt special but homely at the same time. The Balmoral, i is the best Hotel i have ever stayed at. Wonderful stay. Fabulous property but even better staff. Especially concierge sandy and several of the kilt-clad greeters at the door. Great fitness center and spa. It was a wonderful experience; which I enjoyed from beginning to end. The bell man was amazing and he really understands the word service and customer orientation. Very efficient staff and a prime location at the heart of the city. We loved the standard of service and the relaxed atmosphere of the hotel. We’ll definitely return to the Balmoral on our next trip to Scotland. Beautiful hotel with the perfect location and, above all, old world service provided by a friendly and charming staff. The absolutely wonderful service provided made the hotel one to which we look forward to returning. I am very satisfied with this magnificent hotel and the professionalism of the staff. Hated to leave. Incredible suite and view. Thanks for making our 40 th anniversary memorable! The hotel and the room were sublime. The Number One restaurant deserves a special mention because of the quality of the food and the high quality of the service. Really Excellent hotel for evident quality and friendliness: in particular, I want to point out the great help given to us by the doorman and his staff. It is a fabulous hotel-experience of a lifetime. Would return in a heartbeat! Nice hotel within walking distance to shops and public transport. I will consider The Balmoral for my next visit. A very traditional, sumptuous and sophisticated hotel, the staff were all very friendly and efficient, I would recommend it to all! A marvellous hotel, a monument of Edinburgh, very classy and very stylish, an unique experience, I would be very happy to come back and I will recommend it to all my friends! Beautifull hotel! We will definitely go there again when in Edinburg. However, we though the restaurant was better overall on earlier visits. An excellent hotel, where we received a very warm welcome from the whole team who were very attentive to our needs. The quality of service and the welcome were much appreciated and makes us want to test the other hotels in your collection. We recommend this hotel when on holiday in Edinburgh. Beautiful hôtel, with a nice location. No doubt we will stay at this hotel again when we come back to Edinburgh. The room was very nice with a really comfortable bed. I felt in love with this place and I will be happy to return. The hotel is in a great location to visit Edinburgh. The Service in the restaurants and bar are very friendly. The Service of the concierge desk is efficient and friendly. The decoration of the hotel is nice. The size of one rooms was too small. The hotel is beautiful and very well located. The staff is attentive and very friendly and the personalized welcome is very nice. Great hotel, great service, excellent quality everywhere. The Hotel has given me what I expected for the price. The Balmoral Hotel is very well located, with a very attentive staff, efficient and friendly. The concierge, Andy, was great - always ready to advise, guide and book activities. Katherina, at Bollinger Bar, was also very efficient and friendly. The restaurant, Number One, was up to our expectations and really deserves a second star without forgetting the sommelier who has fulfilled his role with efficiency and charm.